As a young Jew, I was always very secure in my religious identity. The only times I began to see cracks in the surface involved certain Christmas traditions. To this day, I cannot be in the same room with a Christmas tree without being completely transfixed with it. I have to inspect all of the ornaments, and watch the lights intently as they run in different patterns. Around the time of college, there was another Christmas tradition that came to my attention that has invoked a sort of envy. That tradition comes in the broad category of "special food," and, very specifically, "celebration breads." There is something about the idea of a bread that is only made once a year--a bread that is enriched with decadent ingredients--that has always appealed to me. So many cultures have their own Christmas breads--stollen, pannetone, etc. I love their festive shapes and sparkling sprinkle of candied fruit. I don't actually like the taste of citron, but boy, is it pretty. Perhaps it all comes full circle, and the reason Christmas breads appeal to me is really related to my Jewish-ness. After all, the ceremonial or symbolic bread is not exactly a foreign concept to me. Between the challah and the matzoh, the idea has been pretty ingrained in me. Once, I asked Kurt why he thought I am so attracted to cooking and baking, and he told me he thought it was because I love exploring the nuances of other cultures, and food is one of the most direct ties to that. Whatever the reason, this year I wanted to make a Christmas bread. Luckily, King Arthur Flour provided me with the perfect opportunity. On their homepage last week, there was a picture of a grand bread wreath. It was beautiful--round, swirled with chocolate, and glazed with confectioners' sugar. The minute I saw it, I knew I wanted to make it. I knew that it was going to stretch my abilities as a bread baker, but I was willing to take on the challenge. Last night, I embarked on my journey. I let my Kitchenaid do all the kneading, because the dough was very sticky, and I didn't want to toughen it with too much flour while kneading by hand. I let it rise while we ate dinner, and then rolled the dough out. I sprinkled it with semisweet chocolate chips. It called for chocolate schmear, but I didn't have any (or time to order it), so I used the chocolate chips instead. I was liberal with them, using far more than the 1/2 cup suggested. On went the sugar, and the almonds. 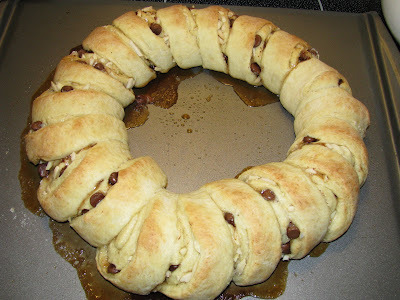 I had Kurt roll it up, since he has become rather proficient at the task after years of making our cranberry-pecan spiral cookies. We sliced it, and made it into a pretty circle, and let it rise again while I chatted with my family on the phone. I took the pictures after pulling the bread out of the oven, but before glazing it. I am sorry that I do not have final photos, since the glaze made it even prettier (and then removed it from the filling-encrusted baking sheet, which also improved the presentation). The end result was a dessert bread that tasted like a dense Danish ring. The chunks of chocolate chips provided a nice bite, and the almonds melted to a near-marzipan quality. I will definitely be making this one again. If you are interested, here is the recipe, courtesy of King Arther Flour. I replaced the Hi-Maize with regular all-purpose flour, and used semisweet chocolate chips in place of the chocolate schmear.